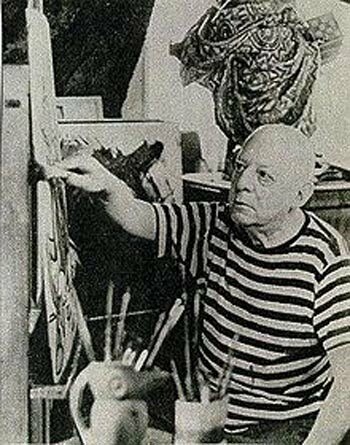 Benjamin Solari Parravicini (1898 -1974) was a well-known Argentinean plastic artist, who in 1939 “allegedly predicted” the terrorist attacks on the Twin Towers by drawing some sketches on paper. However, like so many other people who presume they have also foreseen future events, his case is also a result of his reactive mind that made him write only a wishful thinking. We already know that nobody has the power in the physical to predict future events, not even the Master Jesus had these alleged powers. Only our Creator and time travelers are capable to know for sure future events. Interlocutor: We know that Benjamin Solari Parravicini is considered a prophet and we also know that when we asked you about prophecies, your answered that prophecies do not exist because nobody can know the future, but only the Absolute (Eon) and time travelers, who as a guideline do not say it, unless they make a slip of the tongue about past events. Now that this this issue is clear, my question is: How is it possible that Benjamin Solari Parravicini somehow was capable to anticipate the attack on the Twin Towers? Here I have a drawing he made about the Statue of Liberty and one can see it split in two with a phrase handwritten that says: “The freedom of North America will lose its light. Its torch will not flame like yesterday and the monument will be attacked twice.” (Benjamin Solari Parravicini. 1939) "
My question could be a little bit silly, and I return to ask you for ratification: Wasn’t there any slip of the tongue from a time traveler, or a breach of secrecy from a time traveler’s Thetan? Ruanel: We can think that the reference is made to the Twin Towers and many other things, like two attacks directly on the statue. Interlocutor: That might happen or not. Ruanel: Correct, they can happen or not. 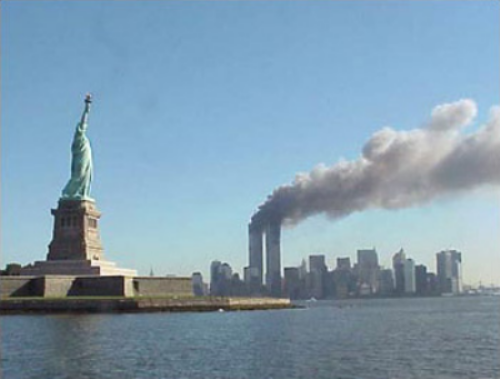 The fact that the attacks on the Twin Towers left in permanent "Orange Alert" to airports, probably prevents other attacks could be made on the Statue of Liberty. Interlocutor: Are you telling me that this drawing and Parravicini’s writing can be interpreted in any way that one wishes? Interlocutor: And in this case, interpreting the drawing and Parravicini’s writing with regard to the Twin Towers is completely unpredictable? Interlocutor: Is it that simple? Ruanel: It's that simple. Why do you want to see complications where there are none? Ruanel: Neither one nor the other, it was directly his reactive mind. There are many “prophets” who have spoken alleged generalities like: "you will discover the secret of the Pyramids", and about this there is so much to tell! Interlocutor: So, when someone "foretells" generalities, this prophecy ends up being like the famous Roscharch Test where one sees whatever one wants to see? Interlocutor: Specifically, then, not by any chance were Parravicini’s writings related to time travelers, which is the only way to anticipate the future? That’s credible, and it happened when Kether, the Ancient of Days, predicted years ago that there was a black hole in the center of the galaxy . Kether was no fortuneteller or clairvoyant. He simply said it because he had the technique and he was in contact with beings that were near the center of the galaxy. This is not divination, and it’s valid. Obviously, if there were a time traveler’s thetan “whispering” future events to your thetan and you say it, it’s also valid. But in the case of this person none of these things happened. There may be things that are said and are intuitive. Suddenly, one can say that a certain government will fall in that country or the other, but this is on the field of the logic and Speculation and nothing more. Interlocutor: Why did Parravicini think something like that? Ruanel: Just because his reactive mind was against the alleged freedom, which for him was oppressive in the United States. And the reference to the Statue of Liberty which was going to be hit twice was nothing more than wishful thinking expressed in that way. Nothing more than that. Interlocutor: Can you perceive what Parravicini was thinking when he made that drawing and wrote that? Ruanel: Yes, of course; his reactive mind, as I said, was against the alleged freedom of the United States, like saying that other countries were oppressed by an alleged democracy and then his reactive mind "predicted" in an irrational way. It was nothing but a destructive expression of desires expressed in the way he did it. Interlocutor: So, in particular, the interpretations made today on that drawing and the texts made by Parravicini have nothing to do with what happened to the Twin Towers? Ruanel: Correct. For example, It's as though you had a small car and you saw a person with an imported car and then you would say: "I predict that this person will crash into a concrete wall and he will die." And all you're doing is expressing a strong wishful thinking so that such thing happens. If later on that car crashes, it doesn’t mean that you have predicted anything. Interlocutor: Does all this mean that if Parravicini had said that the monument would be attacked three times, they would be expecting for a third attack? Ruanel: If he had said three times, it would be valid because it would include the attack on the Pentagon. And it would be also valid if he had said that it would have been one attack only because it happened in a single day. Interlocutor: Is Jorge all right to continue and approach the topic related to the attack on the Twin Towers and the Pentagon? Ruanel: No, we will leave it for the next session. Interlocutor: Well, but at least let me know if there is something strange in all this. I ask it because I was studying the topic thoroughly and the data is not consistent at all. Ruanel: There was extraterrestrial intervention. Interlocutor: What?... Don’t tell me!... No wonder why the pieces didn’t fit! Does the government know it? Ruanel: But of course they know! How could they not? Interlocutor: Are they hiding it for that reason? Ruanel: Absolutely! They have found nothing, There is no trace of the plane that was going to allegedly crash into the Pentagon. Interlocutor: You're telling me that Bin Laden had nothing to do? Ruanel: No, what I'm saying is that extraterrestrials took advantage of the opportunity. Interlocutor: Now I understand. Well, I do not want to go deeper because I prefer to leave it for the next session, we’ll delve into the subject the next time. Do you agree? Interlocutor: Is there something more to add on this? Ruanel: No, but I'm very enthusiastic of being in contact with you through this vessel. Interlocutor: Before to conclude the session, I want to tell you something that has happened to me in this session that didn’t happened to me in other sessions, and it’s like Jorge disappeared completely and in the room there was only you and me. I am surprised because in the other sessions we were three, but not in this one. It’s a strange feeling of your strong presence here. Ruanel: It's my same enthusiasm. There is a personal esteem. One says that in the plane 5 there is no personal esteem. Yes there is. We know that we have more affinity with other spirits, but the Spirits of the planes 4 and 5 do not have ego, therefore we are not offended if suddenly I have more affinity with some spirits compared to others. With you I have an affinity of ten, (from one to ten). Perhaps with another entity I have an affinity of eight, and if that Entity is a Spirit of Light, it won’t be offended because offense is ego. I leave all my Light with you. Interlocutor: So long, Master, and thank you. This entry was posted at Saturday, September 11, 2010 and is filed under History . You can follow any responses to this entry through the .